The Adobe Reader is a free software from Adobe that reads PDF (Portable Document Format) files and is widely used on the DNR Web site. Use the links below to jump to the section you'd like to learn more about. Click on the link below to download Adobe Acrobat reader from the Adobe site. Get the Adobe Reader User Guide from Adobe's website. 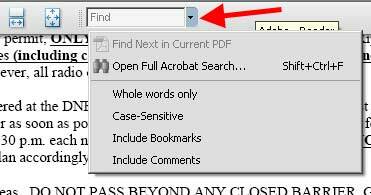 Use Reader's search function to find specific items in PDFs. You can run a simple search, looking for a search term within in a single file, or you can run a more complex search, looking for various kinds of data in one or more PDFs. You can run a search using either the Search window or the Find toolbar. Type a word or phrase into the Find box and press your keyboard Enter key. The search will zoom to the section containing that word or phrase and highlight it in the text. To find the next occurrence or a previous occurrence of the word or phrase, use the Find Next or Find Previous icons. Or click on the binoculars icon on the left side of the PDF screen. The full search appears as a separate window. Adobe Reader allows users to pan, zoom in and zoom out on a map. Moving the PDF page with the hand tool is comparable to moving a paper map around a desk with your hand. Click on the tool, move your curser into the map area, then click and hold on your mouse to move the map around. Increase and decrease the magnification of the map incrementally using the zoom tools. Zoom in with the plus tool and zoom out with the minus tool. The marquee zoom tool allows you to choose a specific rectangular area of the map to zoom in on. Click on the tool, move your curser into the map area, then click and drag your mouse to create a zoom area. *Note: The following instructions were created for printing to a standard printer using 8.5 x 11 size paper. If you have access to a larger format printer, adjust the page size accordingly in the properties window. The following instructions will still apply. In the Print Range section choose All. In the Page Handling section, for Page Scaling choose Fit to Printable Area or Shrink to Printable Area. Since many maps are large and very detailed, you may want to print only portions of the map at a smaller scale. Zoom in to the desired printing area. In the Print Range section choose Current View. In the Page Handling section, for Page Scaling choose Fit to Printable Area. The tiling feature in Adobe Reader allows users to print a full sized map on multiple sheets of paper. In the Page Handling section, for Page Scaling choose Tile all pages.